LiveCode LessonsLiveCode LessonsHow To - LiveCode Mobile Tasks iOS TasksHow do I Send HTML E-Mails with Attachments in iOS? This lesson describes how to launch a new e-mail compose window from within LiveCode and populate the message body with HTML content. Screen captures and example Code are provided. LiveCode supports revMail to send e-mail via the local e-mail client. 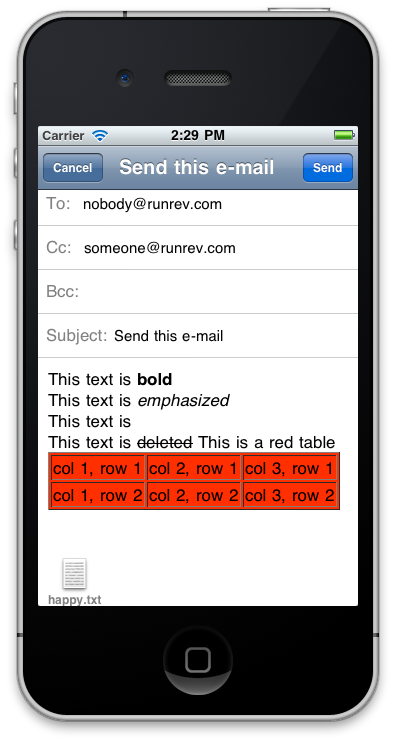 This feature is great for sending text based e-mails without attachments. If you want to add more mailing features in iOS, then you have to use either iphoneComposeMail, iphoneComposeUnicodeMail or iphoneComposeHtmlMail. These commands allow you to send emails in plain text, unicode or HTML. The standard To, Cc, Bcc, Subject, Body and Attachment can be populated. 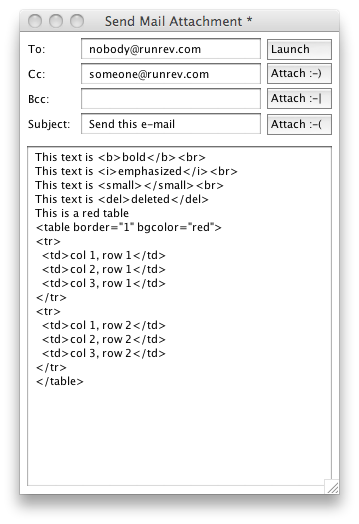 In this lesson we look at the command iphoneComposeHtmlMail to send an HTML e-mail with a number of text attachments. The first step is to set up the user interface through which we can collect information that is to be sent via e-mail. We create text entry fields for the To: e-mail addresses, the Cc: e-mail addresses, the Bcc: e-mail addresses, the Subject: line and the message body. We then add a button that tells LiveCode to Launch the e-mail. Finally we create three buttons that attach text smileys to the e-mail. For demonstration purposes, the fields in the above figure have been populated with values. There is one e-mail address in the To: field and one e-mail address in the Cc: field. It is possible to add further e-mail addresses using comma delimitation. The body contains a number of HTML examples that are rendered and formatted by the e-mail client. The following code sits under the Launch button. It collects the text data from the entry fields and passes this data and any attachments to iphoneComposeHtmlMail. answer the result with "Ok"
answer "Your device cannot be used to send e-mail" with "Ok"
An appropriate message is raised if the iOS device running this code does not support e-mail. The smiley buttons shown in the figure of step Create the Input Fields contain the code listed in this step. Each button provides the text string that is to be attached and the name of the attachment file. The stack script contains the code listed in this step. This code processes activations of the attachment buttons and creates the relevant attachments. Attachments are created in form of a two dimensional array. Each attachment needs to specify the data, the file name and the type of the data that is stored in the attachment. If you use the latter command, rather than the first one, you would only be attaching one smiley to the e-mail. This would be the last one you selected before sending the e-mail. Any previously selected smiles would be replaced by the last one you selected. This LiveCode window allows you to enter the information you would like to send via e-mail from you iOS device. Notice that the content has not yet been formatted into HTML. This stack is for demonstration purposes and you would most likely write your LiveCode application to populate the HTML for you without displaying it to the user. After you have entered the HTML you would like to send and selected a number of smileys you would like to include in the e-mail, you can launch the iOS mail client by selecting the Launch button. We selected one smiley as attachment and then selected Launch. 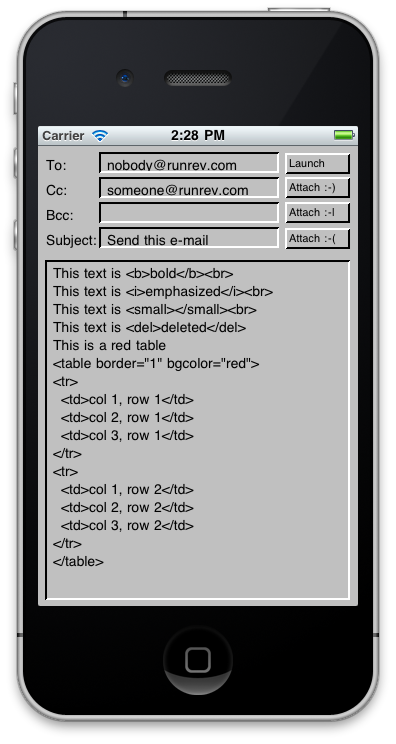 This places all the information from the LiveCode user interface we created earlier into the iOS mail compose window. You could now update the e-mail content using the standard iOS interface, or you could send the e-mail as it is by selecting the Send button. Prev: How do I read/write to files on Mobile? How do you attach a file or pdf created from a print file? I assume you are talking about "open printing to pdf". In this case you can print the pdf file to a file that can be stored on your device. Have a look at "specialFolderPath" for information on what locations you can write to on iOS. Once you have written your PDF file you can then attach it to your e-mail. Use the data structure as outlined in the lesson to attach the data of the file to the e-mail. The dictionary entry "mobileComposeHtmlMail" provides more information on how to attach data.